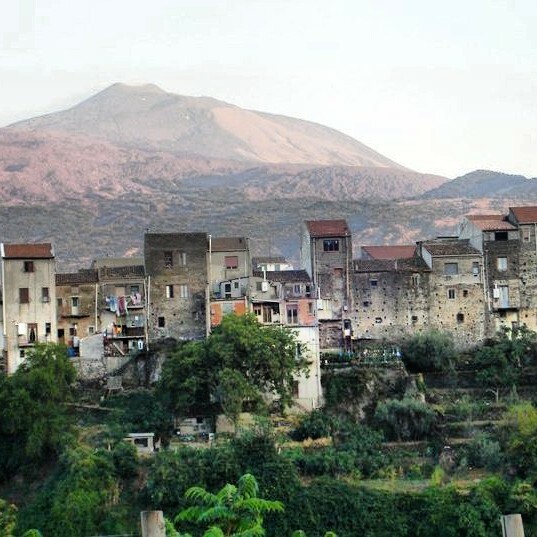 MHere you are quiet Randazzo landscape view, a small Medieval town located, as you can see, bitween the slopes of majestic volcano and the Alcantara river (one of the famous Gorges). Etna stands on our daily operations :-), it was erupting till tonight spreading over all its surroundings the black ash rain due to the paroxysm showings hundred meters high smoke column, playing deep scaring sounds that makes our windows vibrate and lava flow. But doing any hurt to its people as always it does. The UNESCO‘s heritage also Europe’s highest active volcano, gives us anything we need for life being a very reach territory and area. Etna is not only a wonderful “muntagna”, sicilian word to say mountain, it means food, special wine and grapes such as Nerello Mascalese is, tradition, special black lavic rocks architecture, healthy enviroments, natural vegetable, rivers, lakes, fire, water, hot and cold weather, trekking, skiing, old and new craters, biking, holiday, crafts, Mediterranean landscapes, homemade delicious traditional recipes, all that situated only few kilometers far from the sea of Taormina pearl of Sicily, and really much more. Bed and breakfast comfort rooms and tipical products are available. Best regards to all of you reading.